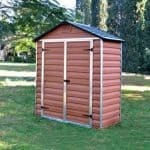 This is ideal if you have limited outdoor space as it has good storage inside without being imposing. 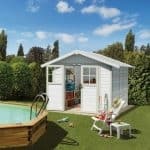 Constructed in a sand coloured durable resin and trimmed in chocolate, it is UV resistant, weatherproof and built to last for years, being completely maintenance free. 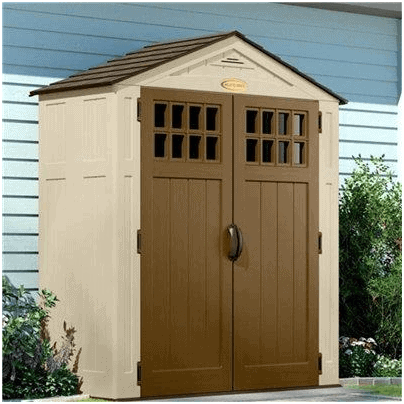 This style has a reinforced shingle style roof and floor so it is extra strong and the large double, lockable doors allow ease of access to your products. 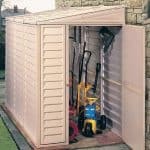 All gardening equipment that is stored in the Suncast Adlington will remain clean and dry. 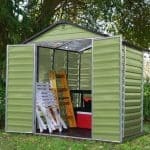 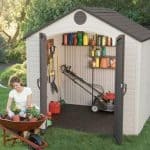 This is easy to assemble with minimum effort and a handsome, small storage solution which works just as well as a secondary building slotting in well to any garden.